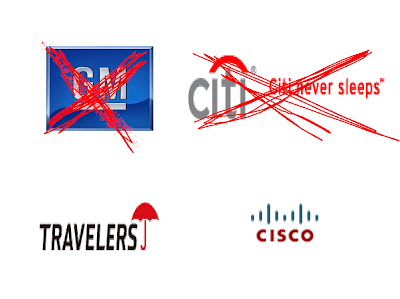 AlphaNinja - Travelers and Cisco have been chosen to replace Citi and General Motors in the Dow30. Based on their share prices, the newcomers' combined weight will be just under 6% of the index, replacing Citi and GM's current combined weight of 40basis points. Sounds great to me, regardless of the index's completely idiotic weighting methodology. For those that don't know, it's based on share price, not market value. 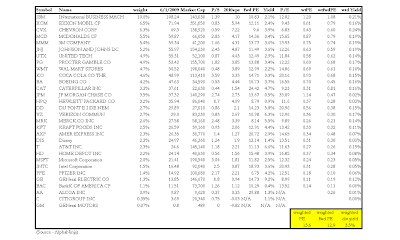 Just for fun, a glance at the Dow 30 - PE's about 13 trailing and forward, and a 3.3% dividend yield are on the cheaper side of average....but we're not in average times.